Laurie Ann has over 25 years of healthcare experience, with deep knowledge of social services. She joined The Seasons as Administrator in 2015, following a position as Administrator of Franciscan Missionaries of Mary Assisted Living in North Providence. Prior to that, Laurie Ann served as Director of Social Services and Mental Health Services at Saint Antoine Residence in North Smithfield. 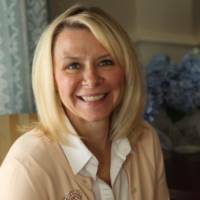 Licensed Rhode Island Department of Health Assisted Living Administrator and Clinical Social Work, Laurie Ann holds a Masters of Social Work from Boston University and a Bachelor’s of Psychology from Worcester State College. Jeany is a graduate of Stonehill College with a BA in Sociology and a minor in Psychology. She went on to finish nursing school and has made nursing her career for the past 26 years. Jeany’s main focus has been on geriatric and psychiatric nursing. She had held positions as Director of Nursing in Assisted Living, Staff Development Coordinator, and has experience in hospice nursing as well. Prior to coming to The Seasons, Jeany was a psychiatric nurse at Butler Hospital in the Geri-Psych and Intensive Care units. Giulianna has over ten years experience in the food and beverage industry. She holds a Bachelors degree in Culinary Arts Management from The Culinary Institute of America. Giulianna has training in both back of the house line-cooking and front of the house hospitality and strives to balance both services to create a welcoming atmosphere to any dining room she manages. A New Jersey native, Giulianna came to RI in 2013 to pursue career opportunities, including several seasons as Shelter Harbor Golf Club’s Function Coordinator and Newport Vineyards. After joining Flik Hospitality group she lead the catering group at Fidelity investments in Smtihfield RI. Giullianna is excited to share her passion with the residents here at The Seasons because there is no better bond than family and food. Lisa holds a B.S. in Public Administration from Russell Sage College. A native Rhode Islander with ties to the East Greenwich/Cowesett area, Lisa has worked and volunteered in this community for nearly 20 years. Her work with health care and community organizations in volunteer administration, long term care facility marketing, and most recently community outreach and event coordination, for The East Greenwich Chamber of Commerce, will serve The Seasons well as she shares our community with potential residents and their families, as well as community professionals. Becky holds a Bachelor of Social work with a minor in Gerontology and a Master of Social Work with a Macro Concentration from Rhode Island College. During her M.S.W. education, she participated in an internship with the Department of Health where she had the opportunity to draft regulations and evaluate performance. Prior to coming to The Seasons, Becky was a social worker for the secured dementia unit within a Rhode Island long-term care facility. Throughout that time, she strengthened her advocacy skills to improve the quality of life for countless residents. Judi has been a member of The Seasons staff for over two years. She is licensed CNA and has worked as an activities professional in Senior living. Judi started her career at The Seasons as the Activities Coordinator of Grandview Gardens. She is currently pursuing her Activities Certification. The Seasons is committed to providing a balance of community, wellness, and assisted living services to independent and memory impaired residents, while promoting resident quality of life, dignity and maximum independence. Possibly just the right place for you or someone you love.